The maternal fetal surface, particularly the amniotic membrane, has several characteristics that make it suitable for use in perio­dontal/alveolar regeneration. The amniotic membrane is part of the inner layer of the placenta; this is a bilayered membrane composed of amnion and chorion.6 Amnion contains five distinct layers: the epithelium, basement membrane, the compact layer, fibro­blast layer and the intermediate (or spongy) layer. The amnion’s epithelial layer is closest to the developing fetus, while the spongy layer is conjoined with the chorion, which is three to four times thicker th­­­­an the amnion and composed of the reticular, basement membrane and trophoblast layers. The trophoblast layer is attached to the maternal decidua.6 Thus, the amniotic membrane is a formidable natural biological barrier that separates the fetal and maternal tissues. It is an immuno­privileged (i.e., nonimmunogenic) tissue. In addition, due to the integral role the membrane plays in fetal development and progression of pregnancy, it harbors significant biological activity. It contains several key developmental cytokines, as well as anti-inflammatory and antibacterial proteins. Due to these properties, amniotic membranes have been used to treat ulcers, burns and dermal injuries as early as 1910.7 Subsequently, amniotic membranes have been used successfully for treatment of chronic neuropathic wounds, ocular conditions, and in orthopedic, general and neurosurgical applications.8 Their use in dental and oral applications was initially explored in the late 1990s, when preclinical and clinical studies first demonstrated the safety and efficacy of amnion-based products in these therapies.9–11 Since then, relatively few amniotic membrane-based products have been commercially available; a key example of this type of device is dehydrated amnion/chorion membrane (DHACM). This is a placenta-derived allograft that is composed of laminated amnion and chorion membranes. The amnion and chorion layers are isolated from placenta and processed with a proprietary dental cleansing process. The amnion and chorion layers are laminated to form the graft, which is dehydrated under controlled conditions.7 In a series of articles, Koob and colleagues6,8 tested DHACM’s physical and biological characteristics, demonstrating the presence of several growth factors, wound-healing molecules and cyto­kines/chemo­kines that regulate inflammation. Amniotic membrane has also been reported to reduce pain.10 In a recently concluded randomized clinical trial (Registry Number NCT02602223; clinicaltrials.gov), the authors of this article noted a significant reduction in pain with the use of DHACM compared to a dense polytetrafluorethylene (d-PTFE) control membrane. In comparison to the d-PTFE control, our trial also demonstrated significant new bone formation, as well as a significant reduction of graft particles with the use of DHACM over sockets grafted with freeze dried bone allografts (FDBA). Reporting on a study of 64 patients, Holtzclaw and Toscano13 noted successful results using DHACM as a barrier membrane for guided tissue regeneration (GTR). In nine patients, they also demonstrated the use of DHACM as a barrier membrane to repair sinus perforations. In a randomized clinical trial, Kiany and Moloudi14 showed that DHACM can provide improvement of clinical periodontal parameters. 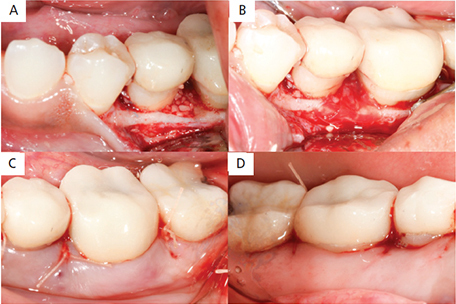 A case series by Esteves et al15 showed the efficacy of DHACM — when used in conjunction with a coronally advanced flap — in providing root coverage for early gingival recession lesions. Rosen et al16 described the use of DHACM in combination with mesenchymal stem cell allografts in the regeneration of Glickman class III/IV furcation defects. In our clinical trial, we observed that DHACM can be used for alveolar regeneration in combination with FDBA, even when left exposed to the oral cavity (i.e., with no primary flap closure). Thus, DHACM can be successfully used in a variety of periodontal and alveolar regenerative procedures. In the following case presentations, we describe the use of DHACM in GTR and ridge preservation without primary closure. This case involved guided tissue regeneration using DHACM and FDBA. Clinical Presentation: The patient was a 22-year-old female who was admitted to the dental clinics at Oregon Health & Science University in Portland. The patient complained that she “might have cracked the tooth in the back left, and there is a bump there that is sensitive.” She reported a positive medical history of asthma, controlled with albuterol inhalation, and a family history of diabetes. The clinical exam revealed a draining sinus tract on buccal gingiva between teeth #20 and #19. The area was tender upon palpation. Probing depths ranged from 4 to 7 mm at or around #20. 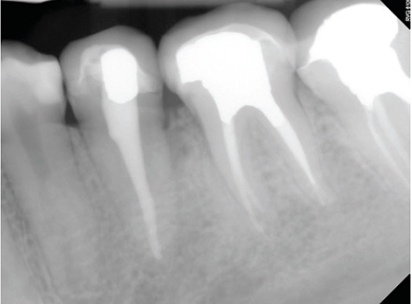 A periapical radiograph of #20 showed previous endodontic therapy, as well as bone loss on distal #20 (Figure 1). The previously treated root canal looked intact and exhibited no signs of pathology. In addition, no response to cold testing was noted on #20, although it was slightly sensitive to percussion. Bone sounding revealed a 12-mm probing depth on distal #20. The sinus tract was enlarged and the swelling was drained. FIGURE 1. Preoperative periapical radiograph of tooth #20. The patient was prescribed amoxicillin 500 mg, two capsules TID, for seven days, along with a chlorhexidine mouthrinse. At the two-week follow-up appointment, probing depths remained unchanged. Draining access was still noted on the buccal gingiva. The treatment options discussed included exploratory surgery to identify possible etiology of access — for example, a potential vertical root fracture, GTR, exodontia of #20 with implant placement or a fixed dental prosthesis. The patient elected to undergo exploratory surgery with possibility of GTR if no vertical root fracture was noted. Written informed consent was obtained. It was also noted the patient had recently received scaling on her entire dentition as part of a routine dental prophylaxis. The importance of oral hygiene efforts were reinforced. FIGURES 2A and 2B. As seen in these intraoperative images of #20 immediately after flap elevation and degranulation: a three-walled defect noted on distobuccal of #20 (A); and an intact lingual wall (B). Case Management: Informed consent was reviewed with the pa­tient, along with a discussion of risks, benefits and alternatives for the procedure. Her vitals were recorded and were within normal limits. Anesthesia was obtained using a mandibular block with 108 mg of 2% lidocaine with 1:100000 epinephrine. A full-thickness muco­periosteal flap was elevated on both buccal and lingual as­pects of teeth #18 to #21 with the help of intrasulcular incisions. The root surfaces were thoroughly debrided. Granulation tissue was removed from the distobuccal and distal aspect of #20, revealing a deep, narrow three-wall osseous defect approximately 8 mm deep. Bone levels around #18, #19 and #21 were all within normal limits (Figures 2A and 2B). The root surfaces were further instrumented with hand instruments and ultrasonics using diamond-coated ultrasonic tips. Root biomodification was completed with ethylenediaminetetraacetic acid. FIGURES 3A through 3D. Shown in these intraoperative images of guided tissue regeneration of #20: osseous defect filled with freeze-dried bone allograft (A); dehydrated amnion/chorion membrane draped over the bone graft (B); buccal view with sutures (C); and lingual view with sutures (D). A particulate FDBA was packed into the defect with condensing instruments (Figure 3A); next, DHACM allograft was inserted interproximally and draped over the bone graft (Figure 3B). The excess membrane was folded over the membrane itself (i.e., without trimming), the flaps were replaced and sutured with 4-0 polyglactin interrupted sutures, and hemostasis was achieved (Figures 3C and 3D). Written and verbal postoperative instructions were provided to patient, and 500 mg of amoxicillin TID was prescribed for seven days after surgery. For analgesia, 600 mg of ibuprofen was prescribed as needed, up to four times a day. The patient reported taking the pain medication only on the day after surgery. At the one-week postoperative appointment (Figures 4A and 4B), the patient was asked to gently swab the surgical area with chlorhexidine. The patient was seen one month postsurgery (Figures 4C and 4D). regeneration on tooth #20: buccal view at one-week postoperative appointment (A); lingual view one week postoperatively (B); buccal view at four-week postoperative appointment (C); and lingual view four weeks postoperatively (D). Clinical Outcome: At the one-month postoperative appointment, a periapical radiograph was taken of the area (Figure 5), and the distal of tooth #20 appeared to have increased radiopacity (as compared to the preoperative radiograph), potentially suggestive of bone fill. The patient was subsequently seen at eight months, at which time probing measurements were taken. Probing depths ranged from 2 to 3 mm circumferentially, with a pinpoint 4-mm probing depth that was noted on distal of #20. These findings must be interpreted in the context that eight months is a relatively short follow-up period for these types of procedures. FIGURE 5. Periapical radiograph of tooth #20 taken four weeks after guided tissue regeneration. 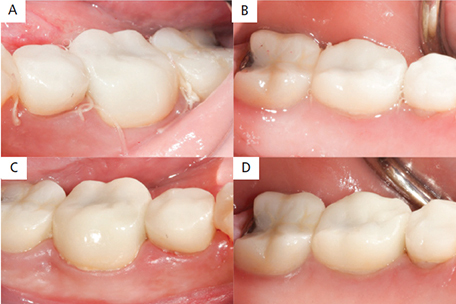 This case included ridge preservation using DHACM covering FBDA that was left exposed to the oral cavity. Clinical Presentation: The patient was a 41-year-old female who was referred to the graduate periodontic clinic at Indiana University School of Dentistry in Indianapolis for evaluation of fractured tooth #4. She reported a positive medical history of hyperlipidemia, seizures as a child, and a tonsillectomy. The patient was taking 20 mg simvastatin QD. 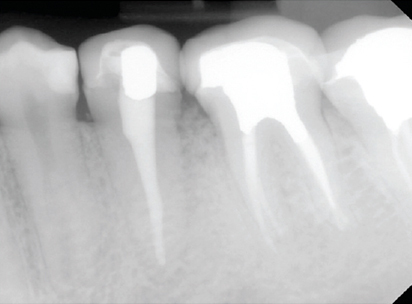 A periapical radiograph of the area revealed evidence of a mesiodistal crown fracture. The interdental and periapical bone appeared intact. The treatment options discussed included extrusion of #4, followed by endodontic treatment and replacement with crown; exodontia of #4 and replacement with a fixed dental prosthesis; or exodontia of #4 and replacement with an immediate or delayed implant. After a detailed discussion of costs, benefits and risks, the patient elected to have exodontia with an implant, and informed consent was obtained. She had recently received a prophylaxis prior to referral to the graduate clinic. Although the patient had excellent oral hygiene, self-care practices were reviewed and reinforced. FIGURES 6A through 6C. Intraoperative images of ridge preservation therapy: extraction socket of tooth #4 (A); buccal fenestration noted in #4 (B); and ridge preservation with the bone graft and dehydrated amnion/chorion membrane left exposed (C). Case Management: The patient’s vitals were recorded and were within normal limits. Anesthesia was obtained using a local infiltration with 36 mg of 2% lidocaine with 1:100000 epinephrine. Tooth #4 was extracted with minimal trauma (Figure 6A). Upon thorough debridement of the socket, a buccal fenestration was noted. A full-thickness mucoperiosteal flap was extended further apically, mesially and distally, which revealed the buccal fenestration to measure approximately 4×5 mm (Figure 6B). The socket was filled with mineralized FDBA and a DHACM was placed over the graft and buccal fenestration. A 3-0 polytetrafluoroethylene suture was used in a crisscross, horizontal mattress and interrupted fashion to replace the flaps and stabilize the membrane. Primary closure of the flap was not attempted, and the membrane was left exposed. Written and verbal postoperative instructions were provided to the patient, including a prescription to use a 0.12% chlorhexidine rinse twice a day for seven days. FIGURES 7A through 7C. Postoperative images of ridge preservation therapy: healing of site #4 edentulous area one week postoperatively (A); healing of #4 edentulous area four weeks postoperatively (B); and healing of #4 edentulous area three months postoperatively (C). For analgesia, 600 mg of ibuprofen was prescribed to be taken as needed, up to four times a day. The patient reported taking the pain medication for two days after surgery. At the one-week postoperative appointment (Figure 7A), she was advised to begin brushing gently with a soft postoperative brush, paired with continued use of 0.12% chlor­hexidine twice a day for one more week. The patient was examined four weeks after surgery (Figure 7B) and again at three months (Figure 7C). At four months, the patient was seen for dental implant placement. Informed consent was obtained, vitals were recorded and noted to be within normal limits. A full-thickness mucoperiosteal flap was elevated over site #4 (Figure 8A) and a 4.1×10-mm implant was placed (Figure 8B). The patient was seen two weeks after implant placement (Figure 8C). After six months, the final restoration was placed (Figure 8D). FIGURES 8A through 8D. As seen in these views of dental implant placement and restoration: exposed ridge at site #4 edentulous area after flap elevation for implant placement (A); implant #4 with healing abutment in place prior to flap closure (B); view at the one-week postoperative appointment (C); and the final restoration seen six months after implant placement (D). Clinical Outcome: One week after ridge preservation, the site appeared to be healing well and showed no signs of infection (Figure 7A); in addition, the patient reported no discomfort — even though the membrane was left exposed to oral cavity. Complete epithelialization of the socket was evident at four weeks (Figure 7B). At the three-month examination, the site was completely healed, and a well preserved ridge was noted (Figure 7C). At time of implant placement, the underlying ridge appeared to be well mineralized (Figure 8A) and allowed for implant placement (Figure 8B). The implant was successfully restored, as seen in Figure 8D). The use of DHACM offers biological and physical advantages that make it an ideal choice for periodontal and alveolar regeneration. 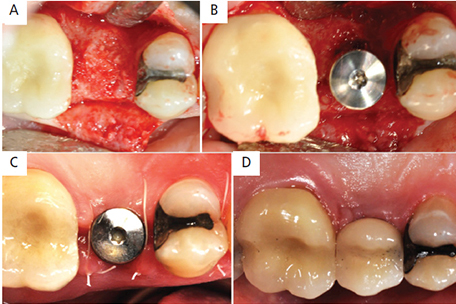 Although a potential weakness may be the membrane’s inability to provide space maintenance by itself, this can be overcome by achieving space maintenance with bone graft and/or additional resorbable membranes, as shown by Rosen et al.16 Overall, DHACM’s thinness allows it to be placed in narrow interproximal areas, while its toughness, ability to promote rapid epithelialization, and wound-healing properties allow it to be left exposed in the oral cavity. These attributes make this material relatively easy to use, thus simplifying GTR and ridge preservation procedures. Dehydrated amnion/chorion membrane (DHACM) can be successfully used in a variety of periodontal and alveolar regenerative procedures. Holtzclaw and Toscano13 successfully used DHACM as a barrier membrane for guided tissue regeneration, and also demonstrated its use in repairing sinus perforations. A clinical trial by the authors demonstrated that DHACM can be used for alveolar regeneration in combination with freeze-dried bone allograft — even when left exposed to the oral cavity (i.e., with no primary flap closure). Melcher AH. On the repair potential of periodontal tissues. J Periodontol. 1976;47:256–260. Nyman S, Gottlow J, Karring T, Lindhe J. The regenerative potential of the periodontal ligament. An experimental study in the monkey. J Clin Periodontol. 1982;9:257–265. Nyman S, Lindhe J, Karring T, Rylander H. New attachment following surgical treatment of human periodontal disease. J Clin Periodontol. 1982;9:290–296. Freitas RM, Spin-Neto R, Marcantonio JE, Pereira LA, Wikesjö UM, Susin C. Alveolar ridge and maxillary sinus augmentation using rhBMP‐2: a systematic review. Clin Implant Dent Relat Res. 2015;17 (Suppl 1):e192–e201. Tatakis DN, Promsudthi A, Wikesjö UM. Devices for periodontal regeneration. Periodontol 2000. 1999;19:59–73. Koob TJ, Lim JJ, Massee M, Zabek N, Denozière G. Properties of dehydrated human amnion/chorion composite grafts: implications for wound repair and soft tissue regeneration. J Biomed Mater Res B Appl Biomater. 2014;102:1353–1362. Davis JS. Skin transplantation. Johns Hopkins Hospital Reports. 1910;5:307–396. Koob TJ, Rennert R, Zabek N, et al. Biological properties of dehydrated human amnion/chorion composite graft: implications for chronic wound healing. Int Wound J. 2013;10:493–500. Gurinsky B. A novel dehydrated amnion allograft for use in the treatment of gingival recession: an observational case series. J Implant Adv Clin Dent. 2009;1:65–73. Velez I, Parker WB, Siegel MA, Hernandez M. Cryopreserved amniotic membrane for modulation of periodontal soft tissue healing: a pilot study. J Periodontol. 2010;81:1797–1804. Wallace S. Radiographic and histomorphometric analysis of amniotic allograft tissue in ridge preservation: a case report. J Imp Adv Clin Dent. 2010;2:49–55. Koob TJ, Lim JJ, Zabek N, et al. Angiogenic properties of dehydrated human amnion/chorion allografts: therapeutic potential for soft tissue repair and regeneration. Vasc Cell. 2014;6:10. Holtzclaw DJ, Toscano NJ. Amnion–chorion allograft barrier used for guided tissue regeneration treatment of periodontal intrabony defects: a retrospective observational report. Clin Adv Periodontol. 2013;3:131–137. Kiany F, Moloudi F. Amnion membrane as a novel barrier in the treatment of intrabony defects: a controlled clinical trial. Int J Oral Maxillofac Implants. 2015;30:639–647. Esteves J, Bhat KM, Thomas B, Jothi MV, Jadhav, T. Efficacy of human chorion membrane allograft for recession coverage: A case series. J Periodontol. May 12, 2015. Epub ahead of print. From Decisions in Dentistry. August 2017;3(8):21–25. Sivaraman Prakasam, BDS, MSD, PhD, is an assistant professor in the Department of Periodontology at Oregon Health & Sciences University in Portland. A diplomate of the American Board of Periodontology, he can be reached at prakasam@ohsu.edu. Ryan Yim, DDS, is a graduate resident in the Department of Periodontology at the Oregon Health & Science University School of Dentistry. Muyeenul Hassan, BDS, DDS, MSD, is a board-certified periodontist who practices periodontics and implant dentistry in Bradenton, Florida. He is a diplomate of the American Board of Periodontology.